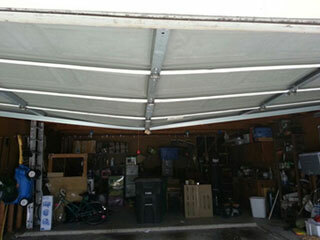 A bent or damaged garage door panel can really diminish the appearance of your home. For many homes, the garage door is the first thing that people see when they approach your home. If you have a panel that is damaged, we can replace it – no need to replace the entire door if only one panel is bad! We can provide a panel that is a perfect match to your existing door, to get your door working and looking like new again. Call us for professional garage door panel repair! If you are considering updating the look of your garage, you may not need to replace your existing garage door. Our professional technicians can replace the top garage door panel with a panel that contains windows to give your door a fresh new look! And the windows allow natural light into your garage so that it is not so dark during the day. There are many options from which to choose that can change the appearance of your home. Of course, if you do decide to replace the entire door, we are happy to do that instead. Our technicians are trained and equipped to handle any job! When you need to replace a garage door panel or an entire garage door, count on the experts at Garage Door Repair Naperville, IL, Our technicians will complete the replacement so that you have a door that looks nice and works great! Garage doors are our business – we will make sure that everything is working properly so that you are satisfied with our work. Our professionals have the expertise to complete any repair or replacement job! Call us today to schedule our professional repair service!